Hi-Five is your ticket to get in the game with your very own youth sports business. 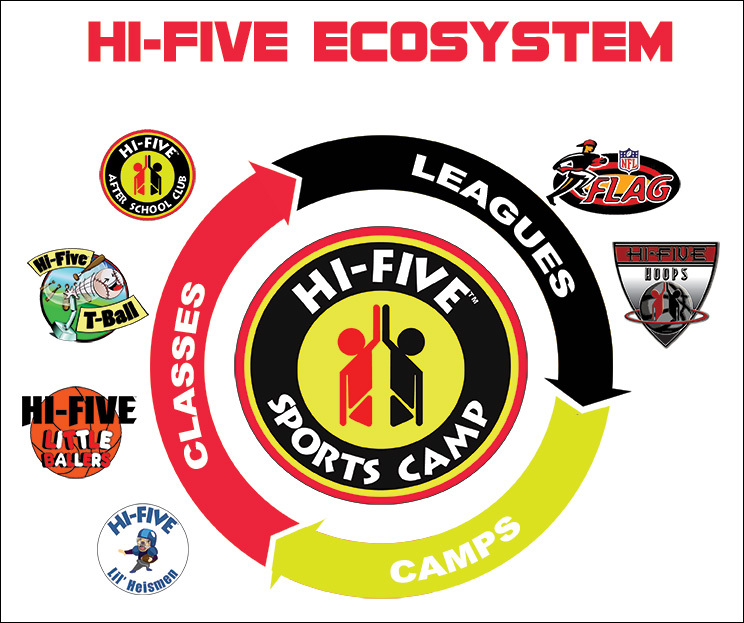 Hi-Five will give you the tools necessary to have your very own Hi-Five Sports Club or Hi-Five Sports Zone (facility). 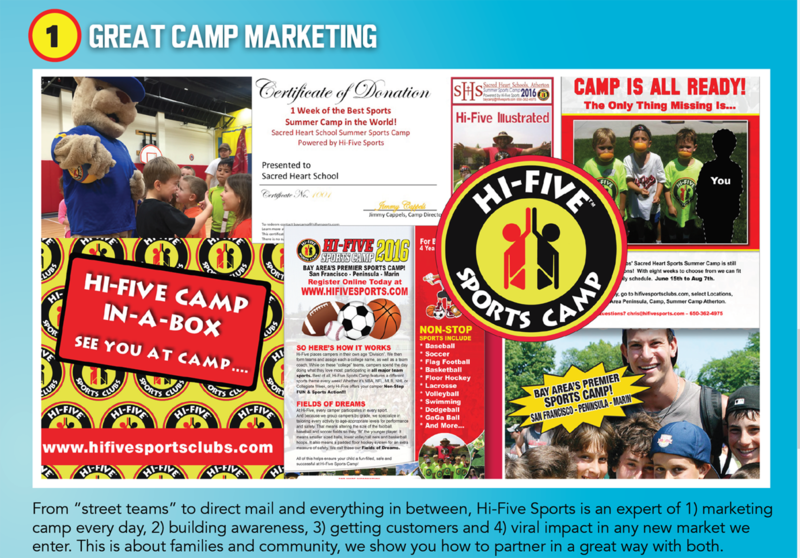 All Hi-Five franchise models focus on year-round programming that culminate with our famous multi-sport summer sports camp. We see our summer multi-sport camp as the "sporty" version of your typical day camp with all the themes and events that go along with it. Hi-Five Sports Franchises also include the following programs to feed into your Hi-Five Sports Camp. 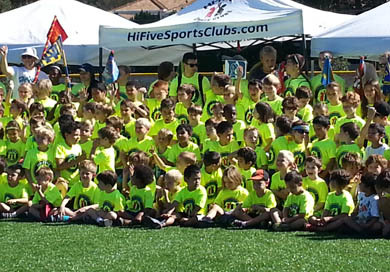 With nearly 30 years of experience, Hi-Five continues to innovate the youth sports industry with its unique take on "Youth Sports Entertainment". We provide what’s new, different, exciting and fun. Kid-sized courts and fields are specifically designed for younger players to build confidence and success. Parent convenience and program quality is our focus. Our mascot Murphy is great for birthday parties and community events. 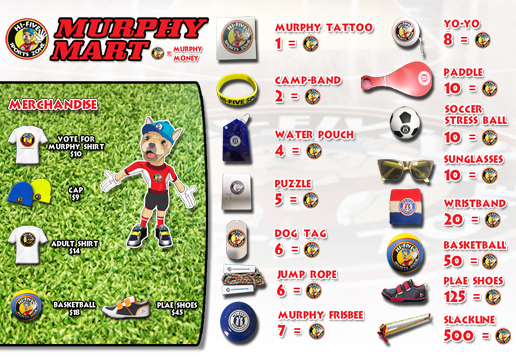 The Murphy Mart exchanges “Murphy Coins” earned from their participation and sportsmanship, into branded prizes. The Hi-Five Sports Zone is your own small scale, recreational sports center. At under 15,000 square feet, you get to set up where families live and shop. 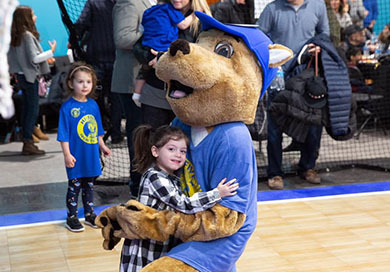 You run all the fun-filled classes, leagues and camps plus amazing sports birthday parties complete with our mascot Murphy and turning “Murphy coins” into party prizes. This great resource to your community scales fast, allowing others to rent and the ability to connect with schools. We have a whole community launch plan to create the kind of splash at your grand opening that leads to program and birthday party sales, right from day one. You also get an exclusive territory, so when you’ve outgrown the building, there’s plenty more revenue coming outside the facility walls. We call this "Retail with Reach"! You love kids’ sports, now, build your business! 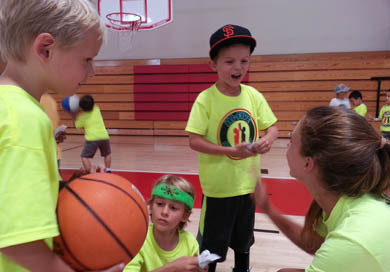 Hi-Five Sports Club operates year-round sports programs and our famous summer multi-sports camp at various facilities through partnerships and/or rental agreements. For some, this is the first-step before transitioning in our brick and mortar Hi-Five Sports Zone concept. 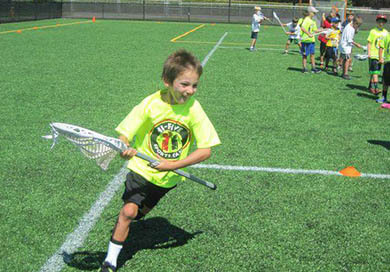 Fun and sports fundamentals are what we provide for ages 3 – 13. Hi-Five has multiple, easy to deploy marketing strategies including our costume mascot for community events, school relationship plans, direct mail and community promotion packages. Hi-Five has a well designed, easy to use, password protected website specifically for our franchisees at hifivesportsfranchise.com. The site includes documented, step-by-step procedures for all of your programs. We also have training videos that are available at your fingertips. Aside from program manuals and videos we also have all of our key logos available for download at any time, as well as, marketing concepts, design templates, and in-house brainstorming ideas. Lastly, we include a state-of-the art e-commerce system fbased in silicon valley. We only work with the best! The programs offered may vary from location to location. We will assist in market analysis to ensure program offerings match community needs. 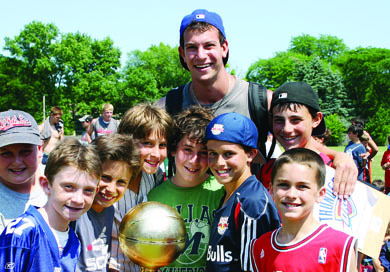 However, Hi-Five Sports Camp remains our marquee program. We don't just offer sports for children. It's entertainment for the entire family. Our leagues and parties become a family event for all ages. Our camps and classes are targeted to children but when the family is present it's an all-out celebration. With over 25 years of experience, you're learning from the best. We've had successes and mistakes in programming and we've turned it into a system that works in any community. 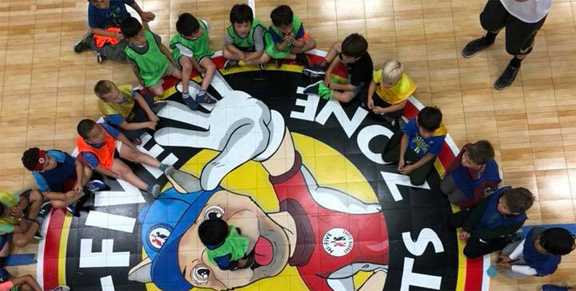 During the lifetime of Hi-Five Sports, the number one lesson learned is there is a project timeline from a new location launch to having a successful Hi-Five Sports Camp. 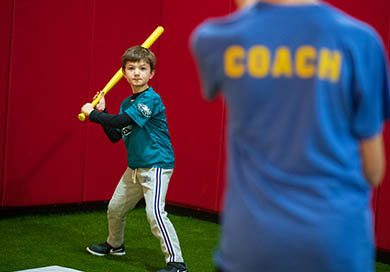 The process starts with running quality toddler classes in basketball, flag football, t-ball and soccer and then offering K-5th grade leagues in those sports. Finally, it culminates into a huge multi-sport summer camp. It's a process that has worked well coast to coast and is a key to your success. 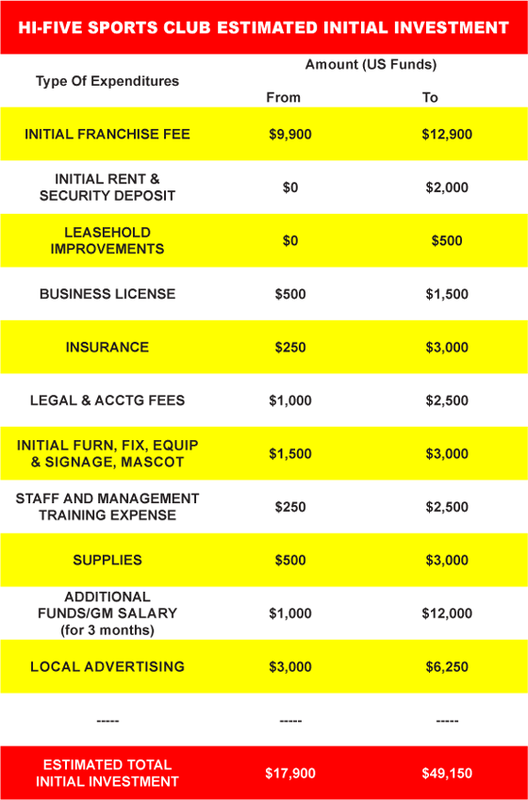 Your start to a great business you’ll love is here. © 2015 Hi-Five Sports Clubs Inc. All Rights Reserved.